Read about our mission, impact and progress in our latest Year in Review. Little is known about the Canadian public’s perspective on clinical trials. CTO and Clinical Trials BC contracted IPSOS to survey 1,602 Ontario and British Columbia residents to determine their understanding of and willingness to participate in clinical trials. Read our journal publication: Survey of Awareness and Perceptions of Canadians on the Benefits and Risks of Clinical Trials. 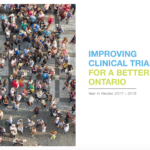 These insights are informing how we approach patient and public engagement with clinical trials in Ontario. CTO has been part of efforts led by Colorectal Cancer Canada to establish ways that patient organizations can be involved with the clinical trials process. The resulting paper, published in the Canadian cancer research journal Current Oncology, suggests that including patient groups as equal partners will generate significant benefits for all stakeholders – and outlines next steps. Read our paper here: Developing a model of a patient-group pathway to accessing cancer clinical trials in Canada. Increasing availability of electronic health records, centralized research ethics review, and novel trial designs, combined with support and resources from governments worldwide for patient-centered research, have created an unprecedented opportunity to advance the conduct of pragmatic trials, which can ultimately improve patient health and health system outcomes. However, such trials raise ethical issues that have not yet been fully addressed. CTO lent its insight to a team of ethicists, trialists, methodologists, social scientists, knowledge users, and clinical trial community members to eveloping guidance for the ethical design and conduct of pragmatic trials. Read the paper here: Developing a framework for the ethical design and conduct of pragmatic trials in healthcare: a mixed methods research protocol.